Over on the Socialized Software blog, Mark Hinkle came out today with a great post called "The Traveler's Guide to the iPad." He also included the great graphic I'm including here on the right. I love to see pictures like this that so aptly capture the intent of the post. Anyway, Mark's post contains a solid list of apps that any iPad traveler should definitely consider. I'm actually quite partial to the Apple case, but that's just personal preference. I like his suggestion for the Verizon MiFi hotspot - I'm eligible right now to upgrade from my current Verizon data card to a MiFi and am definitely considering doing so. I do like his app suggestions... DropBox and Evernote, in particular, are two that are now critical parts of my iPad routine. I also love the fact that an e-book reader allows me to read books on a plane that would be too bulky to carry in my already-space-optimized carryons. One addition that Alec Saunders recently turned me on to was "Rocket Taxi", an app that uses your iPhone GPS to find the nearest taxi companies to call for a cab. It's an iPhone app, but presumably would work great on the iPad as well. I don't know about others of you who use an iPad while traveling, but for me the iPad has definitely become a key part of my travel routine... so it's great to see lists like this offering suggestions for other travelers. If you use an iPad while traveling, what apps have you found useful? As I got ready for my travel down to New York City this week for the SpeechTEK conference where I spoke and also helped staff Voxeo's booth, I reflected as I packed on all the extra steps I wind up going through when planning to be a "content creator" at the show. I'm not there only to talk and show our new services... I'm also there to write blog posts, take and upload photos, record video interviews (and maybe audio interviews), to post tweets and respond to tweets, etc., etc. For multimedia content creation, there's a bit of extra work and gear. My travel pack of choice these days is a Lowepro Fastpack 250. It fits the gear I need, but also has this great feature where you can unzip the side pocket and pull your DSLR out very quickly. As you can see by the picture, I travel these days with a Nikon D90 for photos and a small JVC Everio MG-330 hard drive video recorder. In truth, the D90 can also do video... but it's harder to hold for video than the JVC unit is. Perhaps I'll eventually do more with it... but for the moment I carry both. Both have power cords (or battery chargers), naturally. I also carry a Blue Eyeball (which I reviewed) in case I want to do two-shot video recordings (using my MacBook Pro's camera and the Blue) for an interview. Add to this, of course, the laptop, and these days the iPad as well... and it's a heavy pack. I also naturally have my iPhone for photos and quick status updates and such as well. 1. Import and delete all the photos off the DSLR memory card (which in my case means importing them all into iPhoto on my Mac). 2. Import and delete all the movies off the video camera (import into iMovie for me). 3. Make sure the battery is fully charged on the DSLR. 4. Make sure the battery is fully charged on the video camera. 5. Make sure that I have all relevant cables needed to copy content off of the cameras and onto my laptop. It's not a huge number of steps, but it does add up, particularly if I have a lot of photos or movies on the cameras. Yes, with memory cards being so cheap I certainly could leave the photos on the DSLR, but I'm also paranoid about losing photos... so I want to make sure they are off the camera before I go traveling. If you are a "content creator" for your organization, what do you bring when you travel? What steps do you wind up adding to your travel preparations? Tonight I'm in the process of traveling out to Chicago to speak at the ClueCon conference this week and, as is my habit when traveling, I'm posting random thoughts and updates to my Twitter stream. 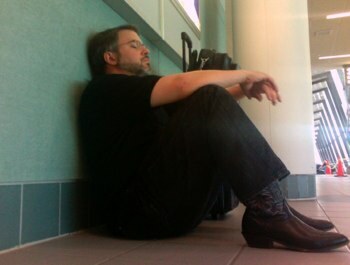 This is the part where I turn Twitter into my personal travelogue... venting area... etc. Since I'm flying into Chicago's O'Hare airport... on a summer afternoon... right at the prime time for afternoon thunderstorms... I pretty much expected that the flight would be delayed. I somehow didn't think we'd be taking off at 5:12pm. Sure enough, we're not. At the time I'm writing this they're currently saying that we'll be leaving around 8pm. Roughly three hours late. And yes, indeed, the US Weather Service has a severe thunderstorm alert out for the Chicago area. Our problem is compounded by the fact that the plane taking us to Chicago is first coming to Manchester, NH (MHT) from Chicago. So they had to get out of Chicago first - with thunderstorms - and then get here and turn around to go back into Chicago and thunderstorms... not a recipe for an on-time departure. Now in theory our plane is currently in the air, which at least means we have a chance of leaving tonight. I had several interesting responses (two of them here and here) basically saying "are we being unreasonable to expect a plane to be there on time?" No, it's not unreasonable to expect planes to be on time. I expect whatever flight I'm on to be delayed. I expect there to be mechanical problems with planes that will cause delays. I expect there to be problems getting crews to flights and associated delays. I expect flights to be fully booked or even over-booked with the accompanying challenges to the gate staff. I expect that my luggage will be lost - so I therefore never check luggage and travel with carry-ons. I expect that I will miss connections and have to stay overnight in interim places (hence another reason not to check luggage). I expect that the airlines will charge for food or run out when they reach me - so I bring my own. I expect there to be other problems that will generally cause delays and issues. And in talking to many other frequent travelers, most all of them have similarly low expectations. We expect to have problems flying. I guess the good news is that with such incredibly low expectations when things do work out much better you can have those rare moments of jubilation (as shown on right). Should we expect better? Sure. Should the flying experience be better? Absolutely. Let's be real... all the airlines are until severe financial pressure. All of them seem to be reducing the number of flights to increase capacity. All of them are complaining about the rising costs of fuel. All of them keep reducing or eliminating many of the food or services you used to get. Find me an airline that isn't charging you for your meal these days? (If they are even offering one.) American Airlines and others are charging for luggage. Today JetBlue said it will charge $7 for a pillow and blanket. Do we see any reason this will change anytime soon? So what do we do? One option is to get agitated like the guy I watched today. But what good does it really do? Now this guy didn't take it out on the gate agent (which I've seen in other places), but what good does that do? They're just trying to do their job. I always load up my iPod with podcasts to listen to. I make sure my laptop is charged up with plenty of things I could work on. I bring a book and magazines. I always travel carry-on so that I can easily divert to other flights or stay overnight. I make sure my cell phone is charged. I use services like FlightStats.com so that when I land I can get immediate info in my Blackberry's email about my next flight's status. I bring enough snacks to suffice for a meal or two. And I always try to make sure that my travel plans can accommodate a delay of several hours or even overnight. Given that I tend to travel a good bit (and expect that to continue with most of the jobs I might take), I often find myself sending messages like the one I sent today to a group of people saying "Will any of you be out at the Podcast Expo next week?" Some of them answered... for others it was just an another annoying email in their inbox. One approach is what you see with Facebook Events, where people can RSVP into the Event inside of Facebook. You can then simply look through the list and see who is there. Upcoming.org works in a similar fashion as do probably half a dozen other services. The challenge is that they are all about events. But what if you are going to be in Boston for one event and a friend/colleague is going to be in Boston for another event? By these event-driven sites, you won't necessarily know that. How does Dopplr work? It lets you share your future travel plans with a group of trusted fellow travellers whom you have chosen. It also reminds you of friends and colleagues who live in the cities you're planning to visit. You can use the service with your personal computer and mobile phone. It's an interesting idea to me, given how often I'm going places. To be useful, of course, it needs to have a certain mass of people using it. If you do use it, my URL is http://www.dopplr.com/traveller/DanYork If you would like to try it out, drop me a note and I can send you an invite. P.S. Congrats to the Dopplr team for receiving early stage funding from an impressive group of investors! I'm Ottawa-bound early tomorrow morning for two days of closing off my activities with Mitel. Heading back to Vermont on Thursday. If anyone reading this wants to connect with me in Ottawa tomorrow or Wednesday, please do drop an email, contact me on Skype ("danyork") or leave a comment here. I will be staying out in the Kanata area.